Golden Tate is an American football wide receiver for the Seattle Seahawks of the National Football League. He was drafted by the Seattle Seahawks in the second round of the 2010 NFL Draft. He played college football and college baseball at Notre Dame. Selected with 28th pick (60th overall) in the second round of the 2010 NFL Draft. Second Notre Dame player to be drafted by the Seahawks in the second round (John Carlson, 2008). Highest receiver drafted since Koren Robinson was selected ninth overall in 2001. Played in 37 career games, starting 22, while recording 157 receptions for 2,707 yards and 26 touchdowns. Tate’s 157 receptions rank third in Notre Dame history, and estab- lished the team’s season record with 93 recep- tions during his final campaign. Placed eighth on the Irish all-time record list with 909 yards via kickoff returns and ranks second with 4,130 all-purpose yards. JUNIOR: Consensus All- American first-team selection. Recipient of the Biletnikoff Award, given to the nation’s premier wide receiver. Shared team MVP honors with QB Jimmy Clausen. Started all 12 games, set- ting school records with 93 receptions for 1,496 yards. His 15 touchdowns tied an Irish record. Ranked third in nation and set school record while averaging 124.67 yards per game receiving. His 1,915 all-purpose yards was the sec- ond-highest season total by an Irish player. Set the school record with nine 100-yard games and became first Irish Player to register two 200-yard receiving games in both a season and career. FRESHMAN: Played in all 12 games (three starts) as a true freshman. Registered 131 yards on six catches with one touchdown. Attended Pope John Paul II (Hendersonville, Tenn.) High School, where he was a USA Today second-team prep All-America selection (defense). Rushed 140 times for 1,413 yards and 23 touchdowns as senior and added 28 receptions for 510 yards and six receiving touchdowns. Registered three interceptions. 11th prep player nationally on ESPN 150 listing. Rated one of top 250 players nationally by Rivals.com, including second among Tennessee prospects and seventh nationally among play- ers in athlete category. Named Charles Greenhill Award winner as top prep player inTennessee and Middle Tennessee High School Football Player of theYear for `06, both by Lawrenceburg (Tenn.) Quarterback Club. Drafted by the Arizona Diamondbacks in the 42nd round of the 2007 MLB Draft after being a standout outfielder for the Notre Dame baseball team. Father GoldenTate, Jr., played wide receiver at Tennessee State and was fifth- round pick of Indianapolis Colts in 1984 NFL draft as 120th overall selection. Full name is Golden H. Tate III . 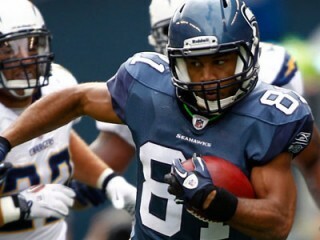 View the full website biography of Golden Tate.